Outlander brings a family reunion and explores the difficult subject of slavery through its connection to the characters. Last week left off on a really dramatic note that pressed the reset button for Jamie and Claire in a sense. They went from people of some means to having little more than the clothes on their back. 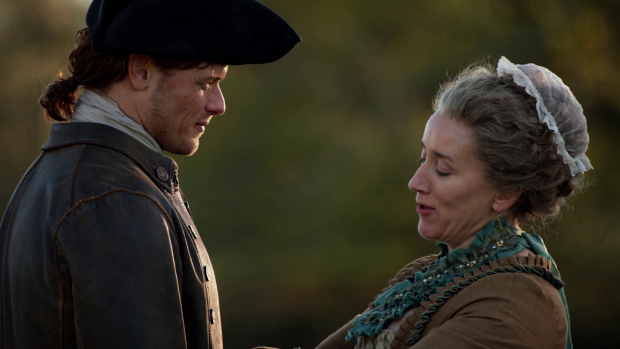 The tone at the start of the episode is a sombre yet quietly hopeful one as Claire accepts what happened to them because she can take comfort in the fact that they are alive and still have each other. This is a lesson well learned by Claire who has realised that she needs little more than Jamie in her life for happiness. Once again the characters are strengthened by their proximity to one another which allows the plot to move forward without dwelling on what came before. This approach has advantages and disadvantages. The ending of the previous episode invites consequences because it caused a great deal of upheaval for Claire and Jamie who lost everything and were frightened to within an inch of their lives. These events aren’t entirely swept under the rug though the writers appear to be more concerned with telling the next part of the story that there isn’t a lot of time to reflect on what happened. It does form the basis of what Claire and Jamie do next as their penniless status doesn’t leave them with a lot of options. In effect they are trapped by circumstances which ends up informing a lot of the drama in this episode. Before getting to that there is the family reunion. Jamie is reunited with his Aunt Jocasta (Maria Doyle Kennedy) after decades of not seeing one another. The last time they crossed paths was when Jamie was a young boy. She is is overjoyed to see him and impressed that her nephew has grown to be strong and tall as well as being a good person. There’s a lot of pride emanating from her during their interactions and an undercurrent of grief as they both acknowledge the death of Jamie’s mother. She is so impressed by her nephew that she looks to make him her heir and turn over the running of the plantation to him effective immediately. He has sufficient knowledge to be more than up to the task as far as she’s concerned and it allows her to enjoy her retirement knowing that her property as well as her business is in good hands. It’s around here the main thrust of the episode kicks in. Claire and Jamie learn that Jocasta is a slave owner though it’s apparently not as bad as it seems because she’s a benevolent slave owner who treats her property as if they were her friends. In fairness there is evidence of this through the banter shared between Jocasta and her slaves suggesting some degree of comfort in the arrangement. The main concern appears to be contrasting Jocasta with her fellow slave owners and pointing out that she isn’t as bad as they are because she treats her slaves better than they do. While there may be some truth to this it doesn’t alter the fact that she keeps slaves and willingly contributes to a system that perpetuates the notion of people as property. Those who defend the concept throughout the episode give the usual arguments that were used at the time in an attempt to justify it on an ethical level. Excuses such as it being an opportunity for people to work are thrown around which is fair enough in the context of the time as that is how people would try to justify ownership of people. It makes them believable as characters who live in 18th century Carolina but it is no less disturbing to see play out. This works because the intent is clearly to disturb since Jamie and Claire are the protagonists who form the audience surrogate. Their opinions should be the audience opinions broadly speaking though the episode can’t shake the attempt to make the audience sympathise with Jocasta as someone who was bound by the practices of the time and has no choice but to participate in this system because there is apparently no other choice. To a lesser extent this mindset extends to Claire who opposes the owning of slaves on a moral level but still takes part by letting Phaedre (Natalie Simpson) dress her while talking down to Jocasta for perpetuating the idea as she herself reaps the benefits. Claire is benefiting somewhat passively but it still counts and makes her resting on her pedestal appear far less credible as a result. In defence of the show this is a really sensitive subject so tackling it must have been a massive challenge but I don’t think the writers have taken a very good approach here. 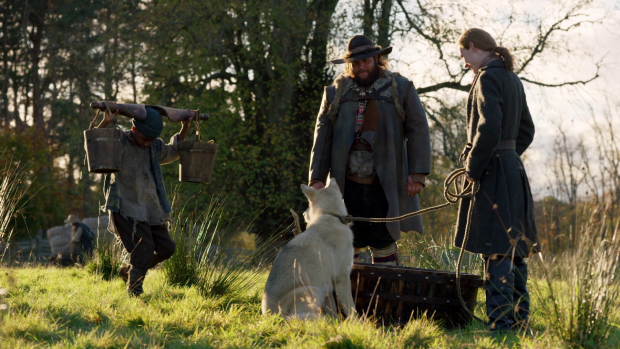 This episode does try to portray the horrors of slavery but it keeps its distance through the Claire and Jamie audience perspective. They’re sympathetic to the situation but wholly detached from it which seems to be the neatest way to gain their perspective. The slavery issue ultimately becomes window dressing for Claire and Jamie story which makes some sense considering the show is about them though it massively limits the potential for covering it in the required detail. Rufus (Jerome Holder) becomes almost the poster child for the Outlander take on slavery though it doesn’t really work because there isn’t enough depth to his character for it to resonate clearly. There is some attempt to flesh him out with a back story but his role in the story comes to an end far too abruptly. It doesn’t help that he exists just to die in order to prove a point and he has no actual say in whether he lives or dies because that choice is taken from him. It makes Claire’s argument to Jocasta that slaves don’t have any say in what happens to them almost worthless since she doesn’t give Rufus that choice even though he could have made it despite his pain. Rufus becomes little more than an addition to the ongoing Claire and Jamie saga. He represents a moral dilemma that they have to deal with and difficult decisions that they have to make in order to navigate this turbulent time period. His death is undoubtedly tragic and the cast conducts themselves well in playing the material they’re given but there’s a forced quality to it particularly when Claire is the one who asks Rufus to tell her his backstory so that the episode can manufacture a reason to be invested in him. Going into this review I didn’t expect my critique to be this harsh but I firmly believe that the approach taken by the writers is the wrong one. Framing this as Claire’s moral dilemma around her oath as a Doctor was a bad choice as it completely sidesteps the real issue at play. Not all of it is bad. Despite the passive acceptance by Claire there is still firm opposition from her and Jamie. Inheriting the plantation from his Aunt is the stroke of luck they desperately need as it gives them a home, resources and security but Jamie has to refuse this because of what accepting the offer would represent. He has the idea of freeing all of the slaves and paying them a fair wage but the mechanisms of the time would prevent him from doing this as the legal conditions required to grant a slave his or her freedom were nearly impossible to achieve. In that respect Jamie’s altruism isn’t enough to combat the conditions of the time because the system is propped up by slavery and there’s nothing he can do to change things on the scale that would be required. I do feel that more consideration could have been given to loopholes and technicalities that don’t change the world but make the situation more tolerable for those on that particular plantation. It’s not perfect but Jamie could have made life better for a fair amount of people on a more informal basis. The only alternative to accepting Jocasta’s offer is less than attractive. They could accept the land grant that comes with allegiance to the crown which has them fighting another War. Neither option is attractive but Claire and Jamie have to find a path to follow in order to progress so it will be interesting to see how they manage to create a life for themselves as free from the constraints of the time period as possible so that they can be painted in the best light. Given that they have no resources at this point it’s a very tough call and that does make for engaging drama even if the execution of this episode was frustrating. Thankfully there was some levity unconnected to the main plot starting when Ian’s dog Rollo chased a Skunk and got himself sprayed. It’s a hilarious situation thanks to the disgusted reactions of everyone who has the misfortune to smell Rollo after the fact. This also allows for the introduction of John Quincy Myers (Kyle Rees); a larger than life presence who gives Ian someone to interact with. His main purpose in this episode is to give Ian information about Native Americans. He likens them to Highlanders which makes for a fascinating comparison that makes a lot of sense when considering that they are both a proud people who had their land taken over by those who weren’t welcome. If there’s a group of people that the Scots can sympathise with in America of this time it’s the Native Americans. I suspect this is foreshadowing for what is to come but for now the taste of light hearted content is welcome and I look forward to seeing more of John. A frustrating episode that completely mishandles the issue of slavery by taking the wrong approach in exploring it. Jamie’s Aunt Jocasta is framed as being somewhat sympathetic as she’s the benevolent slave owner who doesn’t mistreat her property but it doesn’t alter the fact that she willingly keeps slaves which makes her a part of the system though apparently better than others who also keep slaves. In fairness the episode is historically accurate in the arguments used by those who believe in slavery. There’s no getting away from the fact that people truly believed that back in this time period so in that sense the episode works really well. The problems arise in how Jamie and Claire approach the issue. 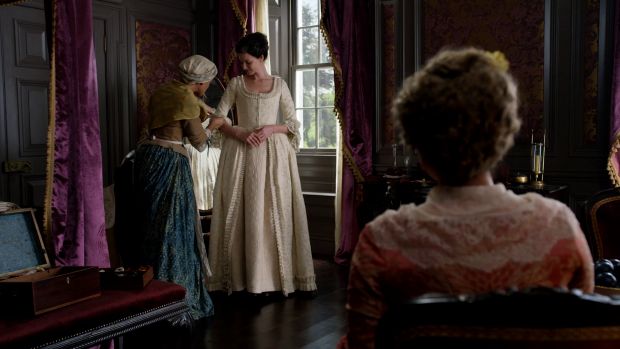 Claire in particular admonishes Jocasta for perpetuating slavery as she allows a slave to dress her. It’s a small participation on her part but still counts and lends her opposition far less credibility. The character of Rufus seems to only exist to further the manufactured moral dilemma placed on Jamie and Claire. His backstory is rushed and the situation is tailor made to give Claire a difficult choice around the oath she took as a Doctor when it should be about the death and mistreatment of a young man who lived as a slave. It isn’t all bad as there is firm opposition from Claire and Jamie as they consider their options. Jamie wants to free all of the slaves but soon learns that it’s impossible under the legal system that existed at the time. Their choices from here are to accept the offer or take the land grant that was offered to them. The former turns them into slave owners and the latter has them swearing allegiance to the crown with the unfortunate consequence of fighting another War. Thankfully there was some levity in a Dog being sprayed by a Skunk and the introduction of John Quincy Myers who makes the interesting comparison between Highlanders and Native Americans that will surely be explored. I have read other reviews critical of the shows portrayal of slavery. While the other reviews make some valid points, I have issue with theirs because they refuse to acknowledge a major point that you point out. This is the Claire and Jamie show. As a book reader, I come to this episode with a different viewpoint, of course. 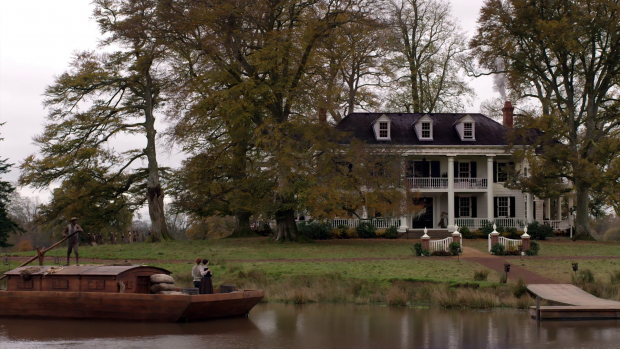 As an adaptation this episode does not, and cannot, cover all the goings-on for Claire and Jamie while at River Run. The show took one of those events and turned it into the last half of the episode. In the book, Claire examines Rufus at [at a sawmill] and determines that the hook did not inflict major internal damage. She is also informed that if she heals Rufus, Rufus will still be hanged later on. 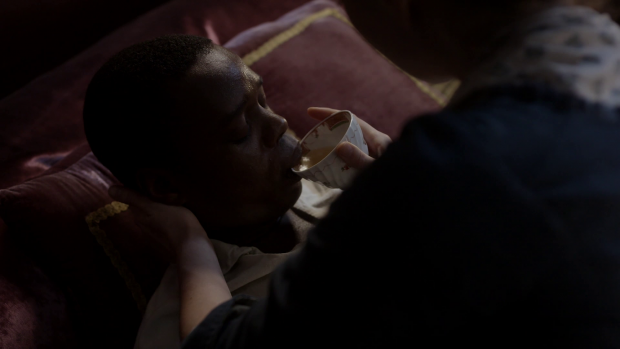 It is at this point that Claire, on her own, decides to give Rufus a deadly cocktail rather than to remove the hook. One event from the book that was left out and I would have liked to see unfold is the surgery that Claire performed on Jocasta’s dining room table. Claire and Jamie met John Quincy Meyers back in Wilmington when she diagnosed an inguinal hernia that made JQM look like he has a third testicle. He shows up at River Run — later than C&J because he traveled by road — extremely drunk in preparation for his surgery. JQM’s timing provided a sufficient distraction at the small dinner part where Jocasta was prepared to announce Jamie as her heir. Jamie had advance notice of the announcement — by way of Ulysses — and had arranged for Claire to create a distraction. She was prepared to jab Phillip Wily — the Dandy from the dinner in Wilmington — with a fork because he was flirting with her. JQM’s arrival ends up providing the distraction. Jocasta does not publicly announce Jamie as her heir. And Claire performs the surgery to repair the hernia on the dining room table in view of the dinner party as witnesses.